Remote monitoring package provides equipment alerts, management reports and location. ROVER operator control units (OPU) are designed to smoothly operate locomotives as well as provide operator feedback on critical information. The ROVER transreceiver incorporates a large screen for real-time feedback of information that can be responded to quickly. The amount of information and options are completely customizable for your application. If feedback is less important, the ROVER-XL OPU is available with LCD or LED feedback. The ROVER L1 OPU provides a straightforward and secure radio remote control solution. The safety switch allows other people around the locomotive to disable the system and apply the emergency brakes. ROVER is FRA compliant and meets the European safety regulations for locomotives (EN 50239). When combined with our new remote monitoring package, ROVER can improve operations with equipment alerts, management reports, locomotive location, and more. ROVER is compatible with the industry leading ZTR SmartStart® and can be integrated with other proven ZTR solutions including BOA™, for advanced wheel slip control, and NEXSYS™ locomotive control systems. 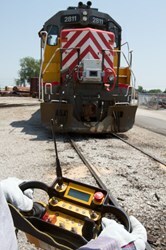 Learn more about ROVER at the ASLRRA Show in San Diego, April 23 and 24, Booth #604 or visit http://www.ztr.com/rover . You may also e-mail railinfo(at)ztr(dot)com, or call 1-952-233-4340. ZTR provides innovative locomotive modernization solutions that improve performance, reliability, and efficiency. ZTR helps railroads gain an additional 15-20 service years out of locomotives with the industry leading AESS, SmartStart® and new products like KickStart™ and the Locomotive Axle Generator. Like us on Facebook and follow us on Twitter.